Vermont WIC | JPMA, Inc. Call the WIC Card Customer Service Help Line at 1-855-769-8890. This line is open 24 hours a day, 7 days a week. When creating a PIN, have your date of birth, zip code and eWIC card number ready. Once you create a PIN, your eWIC card is ready to use at an authorized WIC grocery store. Check the ending balance on your receipt after making a WIC foods purchase. Check your beginning balance at Customer Service before you shop. 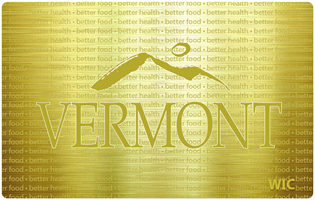 Click below to view the Vermont WIC food list. 32 ounces of whole grains (you choose from approved 16 ounce packages of whole wheat bread, brown rice, whole wheat or corn tortillas, or whole wheat pasta). Details for all food products allowed by WIC are found in the Vermont WIC Program and Food Guide. View here or pick up a copy at your local WIC office. Be sure to buy all your WIC foods each month in which your account is credited. Unpurchased foods don’t “carry over” so make sure to buy all your WIC foods by the last day of each month. All WIC accounts are “zeroed out” at the end of the month.